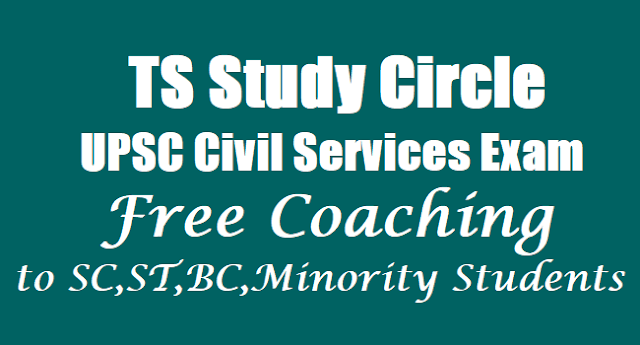 TS SC Study Circle UPSC Civil Services Free Coaching 2018: #TSSC /TS Study Circle/TS SC Study Circle/ TS Study Circle UPSC Civil Services #FreeCoaching Programme 2018 hall tickets, Civil Services Aptitude test(CSAT) Coaching Programme admissions 2018 Notification: Telangana State SC Study Circle would publish UPSC Civil Services Aptitude Test Free Coaching Programme 2018 notification in every year in June month and Online Applications are invited from the eligible SC, ST, OBC candidates belonging to Telangana 31 districts for admission into Civil Services Aptitude Test of UPSC (CSAT-2019) coaching programme at TS SC Study Circle, Hyderabad for the academic year 2018-2019. 1. The annual income of One parent / guardian/family should not be more than Rs.3.00 lakhs for SCs and STs and Rs.2.00 lakh for OBCs. 2. Aspirants should not be employed or pursuing any other courses in any educational institutions during 2017-18, and should have completed the course PG./ Professional degree by the time of applying for the coaching in TS Study Circle, since this is a full time residential course. 5. Aspirants should also be eligible as per the norms prescribed by the UPSC for taking the CSAT-2019 Exam. 6. A candidate should posses any (3) years General degree / Profession Degree for admission. 6. Applicants should also produce the school record upto X class continuously for a period of seven years. Hyderabad and Warangal. For any further details, please contact 9989205048, 7416787173, 8897307189. For any further details, they can obtain information from TS. Study Circle. Banjara Hills, Hyderabad or from the Joint/Deputy Director, SCD Dept. of respective district. Application form can be downloaded from 'Telangana State Study Circle Web Portal" or can obtain from are office of TS. Study Circle, Hyderabad. CSAT-2019 Selected Candidates: District wise Candidates to be provisionally selected as per Merit order for coaching for Civil Services Aptitude Test 2018 CSAT-2019 Selected Candidates. Good evening Sir.. My name Kalyan from A.P. What about A.P Students,.? is 2 pass port size photographs also need to be attested by gazetted officer ? Hello sir i have applied for the Ts study circle program but i do not receive any text messages or hall ticket me and my cousin applied at the same time she got the hall ticket. I have completed my b.tech in 2015, am i eligible to apply for this coaching? sir, extend last date sir from thursday onwards continous holidays? my name is imam saida , i completed b.tech(cse) this year. am i eligible to apply for this? Hai...sir good morning I am swamy naik please change the exam date .. because on the day vizag still plant exam are conducted in central government .so change the exam date please sir.